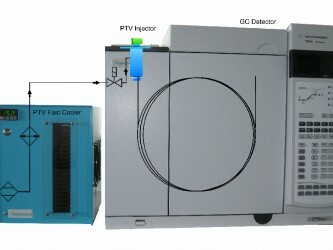 range of GC-MS and GC-MS/MS , fast cooling rates of PTV injectors are increasingly important. 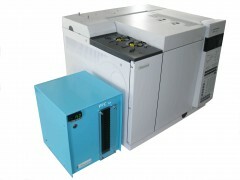 Even the latest generation of gas chromatographs (e.g. Agilent GC 7890) allow to reduce the GC oven temperature in a relatively short time to the desired starting temperature. However often compressed air-cooled PTV injectors turn up to be the bottleneck, if one wishes to do without the use of additional cryogenic media such as LN2 or LCO2 . With compressed air-cooled PTV injectors, only initial temperatures from about 10° C above the oven start temperature can fbe reached. most manufacturers however, do not mention how much time is necessary to achieve these temperatures!. easy to retrofit on all commercial (compressed-air- cooled) PTV injectors from e.g. 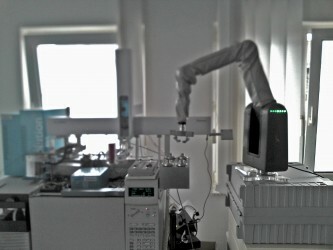 Agilent , Gerstel, JAS , ATAS or Bruker . When starting at a GC oven temperature of 50° C (depending upon the injector type in use), temperatures can be achieved to <5° C within 3 minutes. The advantages of the " PFC option "
Can be retro-fitted to all standard PTV injector types. No cryogenic medium such as LN2 or CO2 required! 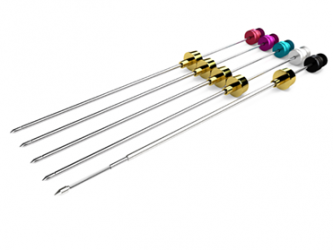 Lower temperatures reached as with Peltier PTV injectors in less time. 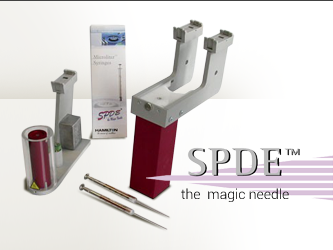 Higher sample throughput by faster injector cooling .